Today is the day we are leaving for the “adventure” part of our vacation and I will find out if I am a true sailor or just a wimpy, wimpy great piano teacher. We left the dock a bit after 10am after fueling Fiona with 150 gallons of diesel (quite reassuring really). Motoring past Salvador was also calming, “just like in Huntington”, I thought. What told me that “we are not in Huntington anymore”, were the huge, no, make that enormous swells that were facing Fiona. Of course I had my life jacket on, my wrist bands securely strapped, my Bonini pills swallowed and just in case a couple of crystalized ginger pieces in my pockets. Soon, the navy-blue water surrounded us. John told me that these enormous 20 ft waves were only about 2 or 3 ft, really... How disappointing! I was doing so well. While I was admiring in disbelieve those waves, the Captain went over the safety procedures. Man over board -- run and press MOB on something downstairs, then stop motor, throw bright yellow life-vest at the lost man and call coast guard, something like that. Never, never go to the front of the boat if nobody is watching you -- funny he said that, I wouldn’t go there if there were 20 people watching me. Always hold onto something, reminiscent of an old sailor saying “one hand for you, one for the boat”. Lastly, he mentioned en passant: you will get a lot of bruises the first few days. As Salvador was about to disappear into the horizon, a group of whales swam by, waiving their tails as wishing us Bon Voyage -- everything will be all right. Every evening we have Happy Hour at 5pm, when we are served Fiona Cocktail: rum, apple juice and a slice of lemon -- delicious. Since we are sailing over-night we had to pick shifts for the night watch. Whaaaaaat? 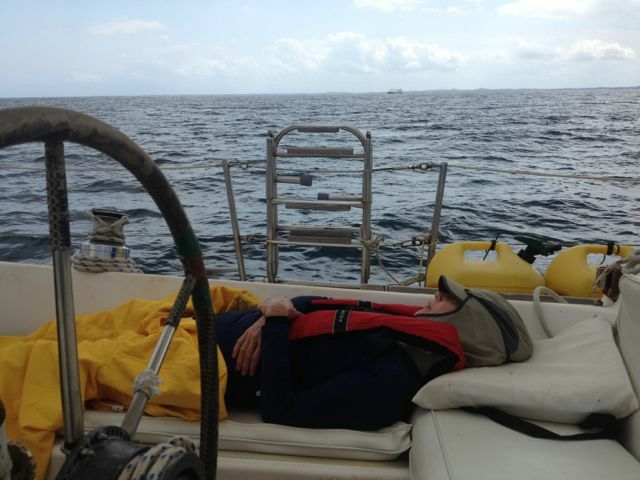 Yes, my dear sailor, you have to be on watch while the rest of the crew sleeps. We drew cards and the lowest card starts. Night watches are 2 hours long and day watches 3 hours. I got the second watch. I will be watching for small fishing boat and enormous tankers from 10pm to 12am and from 4 to 6am. I went to my bunk to get some rest. At 10pm Eric woke me: “OK Helena, you turn is on, the night is clear, calm and there are no boats on the horizon, good night” and the Captain went to bed. I am so ready for this watch. I have my head lamp on, I am wearing my life jacket, my harness is strapped on, I have water to keep me hydrated and a nut bar to keep me awake. It is almost full moon, tomorrow perhaps, the boat is riding hard and I am holding on even harder. I go on deck and my first priority is to strap myself, but to what? how? I have the equipment - no idea how to use it. So I strapped myself to this handle bar next to the boats’ wheel. Great, now I will not fall over no matter what -- although I felt silly wearing the life jacket -- and if I need help or if a boat is on our course I just run down and call the Captain... wait a minute, I am strapped here. Of course, I ended up trapped not strapped, because it took me a good 5 minutes to be able to get loose from the handle bar. I took the strap off, put it below and continued on my watch. Luckily, it was very dark and I was alone and nobody will ever know this happened. Pfeew! And then it happened... a little, tiny light on the horizon, right in collision course with us. A fishing boat, maybe 8 ft wide with two swinging lights, moved to the left, then to the right, then in front.. “OMG, make up your mind, never mind the fishes, can’t you see us coming? Should I wake up the Captain? No, maybe I will wake up John. No, I will wait until a bit longer.” At the last minute we passed the boat on our starboard side (right), it was a close one, but my first watch was over. At 4:00 am I am awaken again by the Captain “Good morning, Helena, you turn is on, the night is clear, calm and there are no boats on the horizon”. I was soooo sleepy, I wanted to go back to the bunk, but I got up, made some coffee and saw one of the most beautiful sunrises ever! Today we arrived in Ilheus.